it kind of freaks me out! We have 4 baptismal dates set and our investigators are doing really well! Mom, did you get the picture someone named Kylee Kay text to you? The pic is of our investigator Tom. He is a Jovo, a young single adult age guy, and he was introduced to the church from a BYU dancer that traveled here a few months ago. He is sooo cool and probably cooler than I think but I don't always understand everything he says. He speaks great English but our lessons are in Dutch. Anyways, we had Kylee Kay skype in for our lesson about keeping the Sabbath Day Holy. We made ice cream sundaes at the church and had an example lesson that turkey and tuna and other things like that are good, but they are good for sandwiches. Just like movies, shopping, and that kind of stuff are fun, they are good for Saturdays but not Sundays. It was super fun and he's doing great. We went to the ward mission leaders house for Dinner the other night and they don't understand English like all of the other members houses we've eaten at. Purely Dutch was spoken and Flemish to be more exact. It was quite hilarious for me actually. I could've just cried and been so overwhelemed but instead, I embraced the moment and smiled and nodded. Super funny. Something I have been working on this week is to have a good Personal Study. Sometimes I get overwhelmed by how many things I WISH I knew or the things that I know I need to be more familiar with, and it stresses me out to the point where my studying is not very productive because I am switching around and doing so many things. I am working on choosing a good solid topic to study and being open to the spirit so I can have an effective study session. 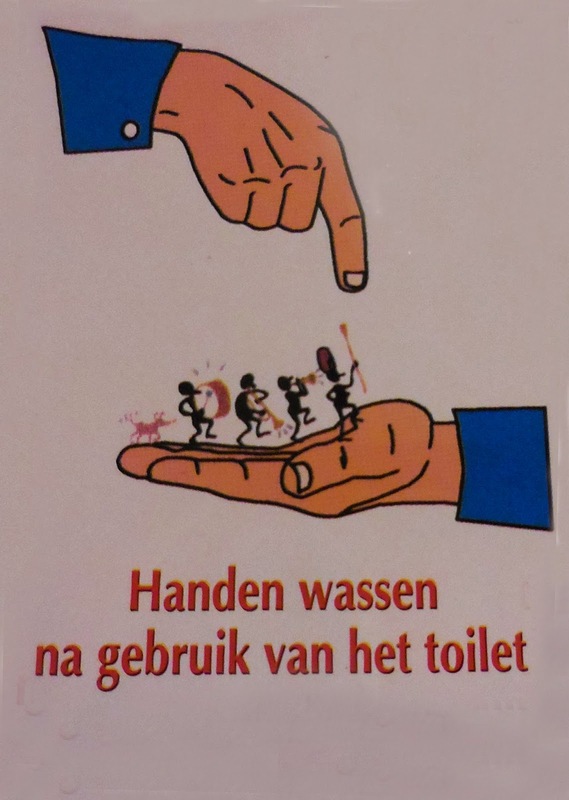 I have been finding it hard to talk a lot in the lessons we are teaching in Dutch because I'm not exactly sure of everything our investigators are saying. It's hard for me to jump into a conversation and actually converse with the investigators right now, but I have found that if I start the lesson then it gives me an opportunity to speak more in the lesson. Flemish is hard for me to understand, but I have felt the influence of the Holy Ghost helping me to understand what is most important. As for teaching lessons in English, I am grateful for that even though it doesn't give me a chance to practice my Dutch. It is important for me to practice teaching information in a simple way, and practicing how I display the information. I've had lots of thoughts this week about if what I'm teaching is really true or not. I KNOW that they are true and I have been living them my whole life, but I think it's good for me to gain an even stronger testimony so that I can testify with conviction. That is what I hope to do this transfer. I've felt a little homesick this week which has been weird, because I didn't think I would, but I've found that putting my whole heart into the work is the cure for that. I've just been feeling homesick in the mornings before we leave for the day, but all will be well, and I am so glad to be here! I am learning and growing everyday! 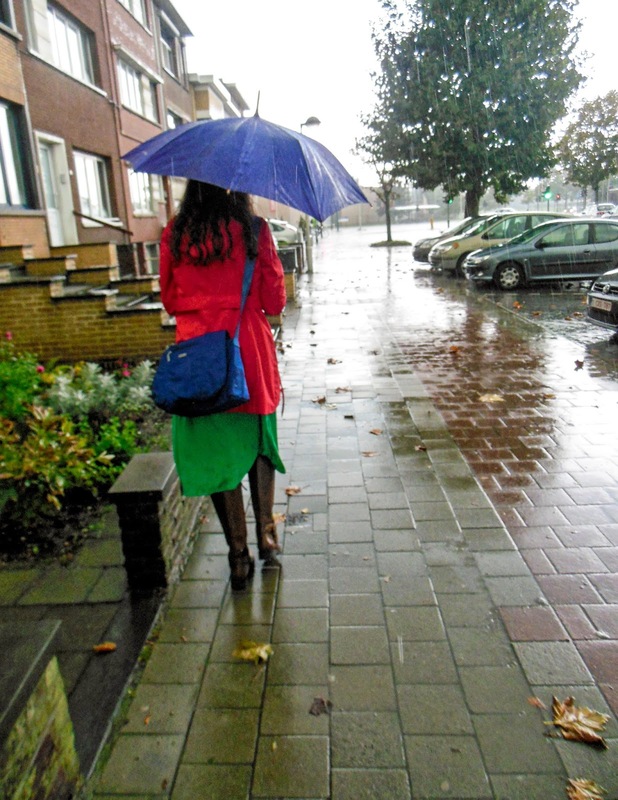 There is never an easy day and a lot of the time it is very hard for me to understand others and communicate in Dutch, but I have felt that my testimony is growing and I am becoming more converted to the work. We are excited for this week to have some of our investigators watch Conference with us, and we have some really great lessons prepared for them. 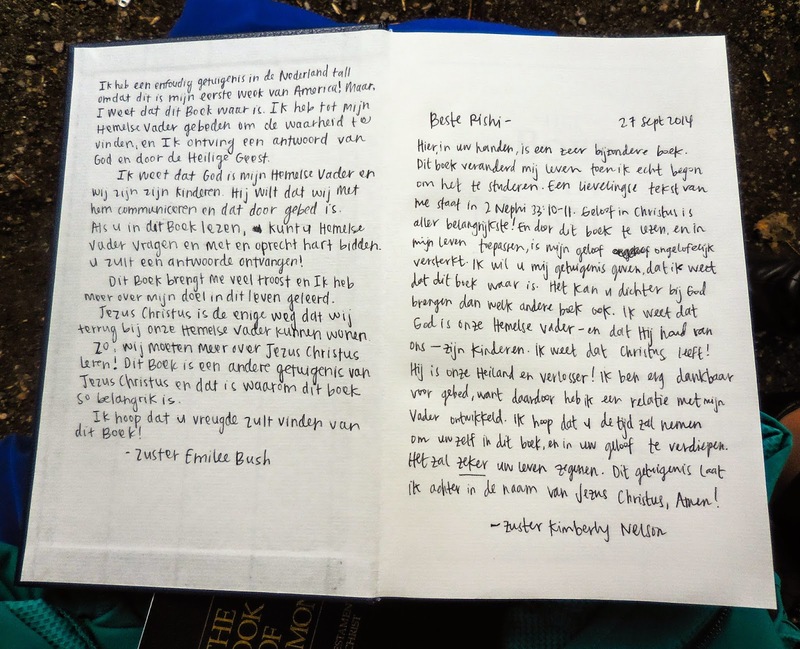 My first time writing my testimony down in Dutch! Did it in like 5 minutes. Crazy that I can do that. We gave this to someone we met on the street one day and said we'd come back to give him a Book of Mormon if he was interested. It will be interesting to look back on this later! I found a cool little dutch phrase book in our apartment! I bring it around with me and read it on the tram. Super great and I love it. Dutch pronunciation has been a bit of a struggle because every person I meet here pronounces things differently. Not sure If I told you this, but they don't say the w as a v here. example: Water in Belgium but Vater in Nederland. I kinda want to have a Nederland accent because it's more pure, but I just have this feeling I'll be in Belgium for quite a while..... Hmmm the struggle is real. We'll see :) You should do some research on different places in Belgium in Nederland. They all have different accents apparently. It's weird. We had Zone training last Tuesday! In Sint Nikklas. Everyone from Belgium was there. There were only 6 sisters and the rest elders. Everyone is so cool and nice! The training was amazing. We talked about having more sincere prayers which is something that I am focusing on. Prayer is one of the most important things to me right now as a new missionary, and I'm sure it will be my whole mission. Also I went to Ghent (about 45 minutes SW of Antwerpen) for exchanges! Really cool to be there. We had a dinner appt with a family who has a daughter in our Mission. Sister V. Can't remember her last name but you'll find her on the blog. Everyone eats fries for dinner here! Chicken and fries with sauce over it and peaches. Interesting but good! Also their Mayo here is SO much better. We have some options for a bike. A 2nd hand bike for sure. It'd probably be better to buy a bike in Nederland because they are more known for biking, But people are telling me I'll probably be in Belgium for a while. I'll get my time in Nederland eventually :) So we're calling around today. 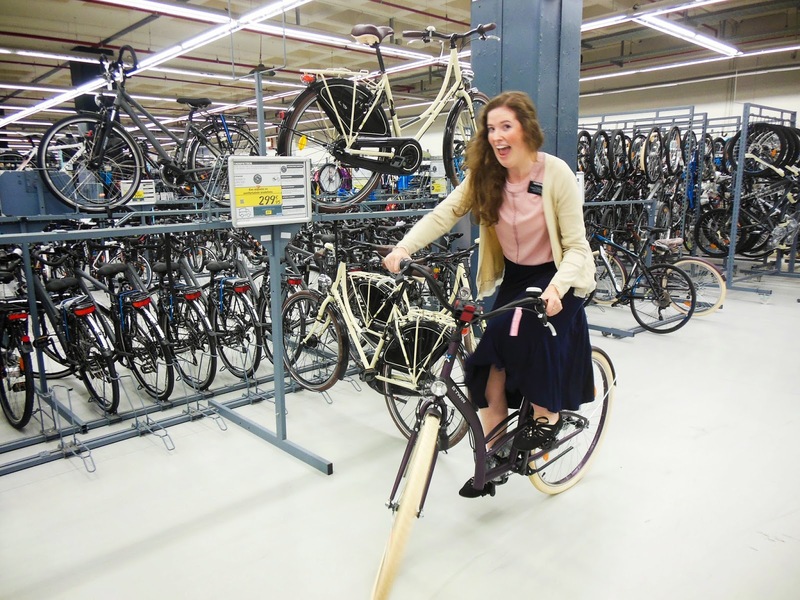 A lady in our ward helped me and she found an Oxford brand bike for 120 Euros that she said would be super good. We have been told to spend about 150 Euros. The weather has been so wonderful here! We went running outside for the first time. I get tired of exercise videos! I loveeeee running outside. There is a cool duck pond and park but it was still pretty dark when we went. Mornings have been really hard for me. Not that I am exhausted, but I just don't feel motivation to study because I get overwhelmed by how many things I'd like to study. It's hard to prioritize! I like to read the quote you gave me by Elder McConkie titled "I am called of God" I love it so much and it gives me comfort. Also I am thankful for the notes and thoughts you sent me in the MTC. I pull them out and read them while I'm waiting for my turn in the shower. There is not a lot of time to study here but I try to take advantage of every minute. 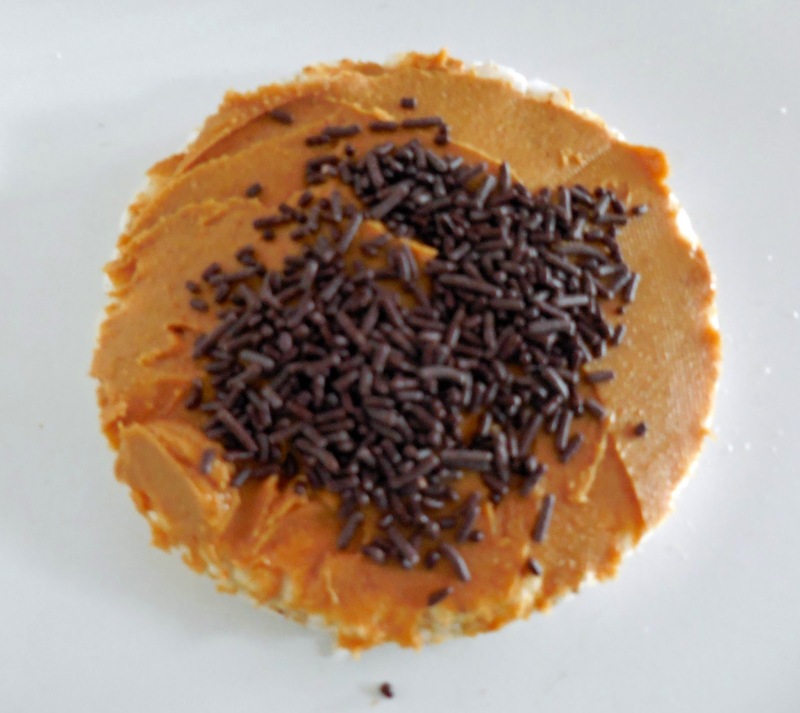 Tell us about Stroopwafels... yummy or no? Belgian Waffles With Nutella... DELICIOUS!!!!! I tried a Belgian waffle with Nutella on it last P-day. Whoaaaaaa baby. Best thing ever. I love treats here. Last week I had a fresh warm Stroopwafel that my Comp bought me in Nederland. They don't have fresh ones here but you can buy some from the store in Belgium that I'm addicted to. Also Spekuloos- look it up. The granola here is WONDERFUL. Hazelnut and Chocolate in it. And Nutella? Better than ever here. Can you smell pizza all the time in your apartment? Google street view is magic, using the address you gave us! Ristorante Pizza or something like that. Yes,we smell pizza all the time. We ate there once. Super good. They have so many pizza places here it is wild! Have you tasted Belgium Chocolate yet? BELGIUM CHOCOLATE IS OH SO GOOD. I'll send you some next transfer or the transfer before I leave. Too crazy right now but I'll get a grip on things and definitely send you some. I don't know. Should I? Not sure if it's too expensive or not. I want to. Ask more questions... What kind of things do you want to know about Belgium, the culture, my day to day schedule? MY BIGGEST HAPPINESS THIS WEEK. . .
We gave a Book of Mormon to our cute investigator Agnes who is from Nigeria. She has it in English but we gave it to her by surprise in Yuruba, her native language. She was so happy and cute about it. Made me remember why I am here. . .
Random things to say cause I have more time than I thought. . .
Dad did you get the facebook message from Brother Schiltz? He is the coolest and totally reminds me of you. We eat dinner at their house every Sunday night and we always have potatoes. I was the official potato masher until last night when we arrived late. We eat with the Zone leaders and other 2 elders in our ward. One big family! So fun. Lots of missionaries here think cow's milk is not even good for you and that you can get same nutrients from soy milk and almond milk. What's your take??? 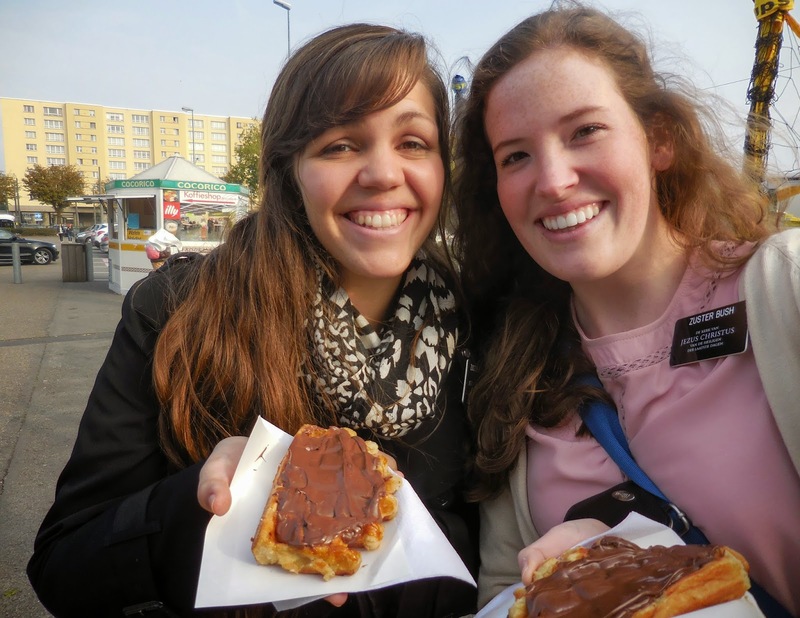 We're having a Sister Conference at the mission home October 11 and then a Temple Conference Oct 14 or maybe 15. Just a heads up. I have no idea if you'd have anything to send in a package, I know it's super expensive, but I'll be able to pick something up on those dates if you were to send something. Can I just say that I am so thankful for you, Mom and Dad. I am more prepared than lots of others in different ways, and I am thankful I had your support and help for leaving on a mission. I hope you don't think I dwell on all of these superficial things. 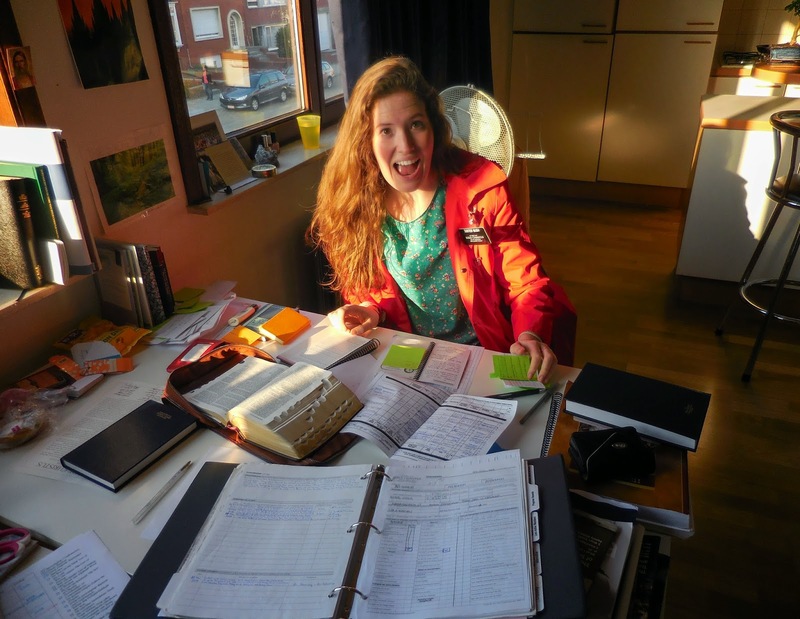 I'm working hard to strengthen my testimony and read from the scriptures everyday and try to apply each "preach my gospel" lesson to my life as a missionary. I LOVE YOU BOTH SO MUCH!!!! Go eat some delicious popcorn for me! Hmmmm... wonder if they have popcorn here.